Mix enough pancake batter to make 16 pancakes. Heat dutch oven lid upside down to about 375 degrees on coals for Frying. Make 8 pancakes on dutch oven lid, keeping them warm on a plate covered with foil. Heat dutch oven to about 350 degrees on coals for Frying. Drop 1/2 tablespoon of butter into dutch oven and move it around with a spatula as it melts. Crack 4 eggs into dutch oven, keeping them separate, and sprinkle them with salt and pepper. Lay 4 slices of ham on upside down lid over the heat. After 1 minute, flip ham slices. After 2 minutes, when eggs are firm, flip them over. 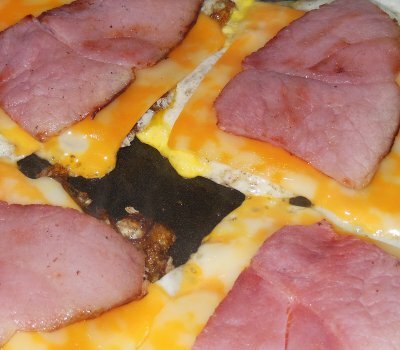 Lay a slice of cheese on each egg and a slice of warmed ham on each cheese slice. Start the next batch of pancakes on the lid. Cook eggs another 2 to 3 minutes, until cheese melts. Serve the egg, cheese, and ham on a pancake with another pancake on top. Repeat, making four McPancakes at a time until everyone is full.